April 26 2018, 2:36 p.m.
More than a year after the election of Donald Trump, the median global approval rate for United States leadership stands at 30 percent – the lowest compared to recent administrations, according to Gallup, and down 18 points from 2016. But there are two small countries that are an odd exception to the near-universal consensus on Trump’s unpopularity. According to a Gallup poll conducted in 134 countries, the approval rating for US leadership under the Trump administration in two Western-Balkan nations is the highest in the world — 75 percent in Kosovo and 72 percent in Albania. Trump is scoring higher in these two nations than in the reddest state of the United States. Gallup found that 61 percent of West Virginians approve of Trump’s performance, well below both Kosovo and Albania. Albanians and Kosovars’ high regard for the United States stems in part from the 20-year-old bombing campaign the U.S. led against the Serbian military, which was carrying out an ethnic cleansing of Albanian Kosovars. 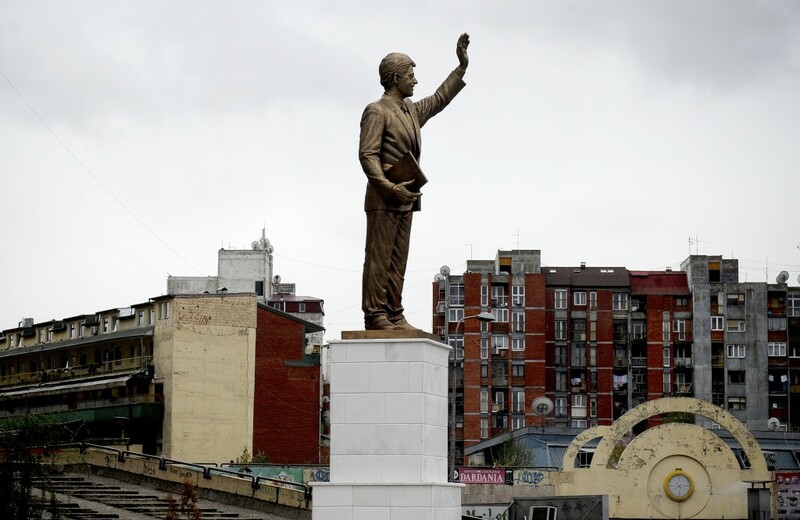 Albanians see the U.S. as the first to stand up for the people of the Kosovo region – when it was still part of Yugoslavia – preventing an even larger human tragedy. Decades later, Albanians still broadly consider the U.S. initiative to bomb the Yugoslav forces with its NATO allies as a clear sign of support. This history matters more than present-day U.S. policies. Children gather at a pizza party in honor of Donald Trump’s presidential victory at a restaurant near Ferizaj, Kosovo on January 28, 2017. In early 2017, Trump banned the entry of citizens from several Muslim-majority countries to the United States — the fulfillment of his campaign pledge to impose a Muslim ban. But in Albania and Kosovo, both of which are inhabited by a majority ethnic Albanian and majority Sunni Muslim population, that’s not much of an issue. There are those who don’t think of themselves as those kinds of Muslims. “I don’t think Albanians will see themselves as that pious of Muslims, that they fear being included in a Muslim ban. I think Albanians are far more afraid about the declining role of U.S. by Trump’s isolating foreign policy views”, said Ylli Rakipi, host of Albania’s most watched talk show, “të paekspozuarit” (The Unexposed). 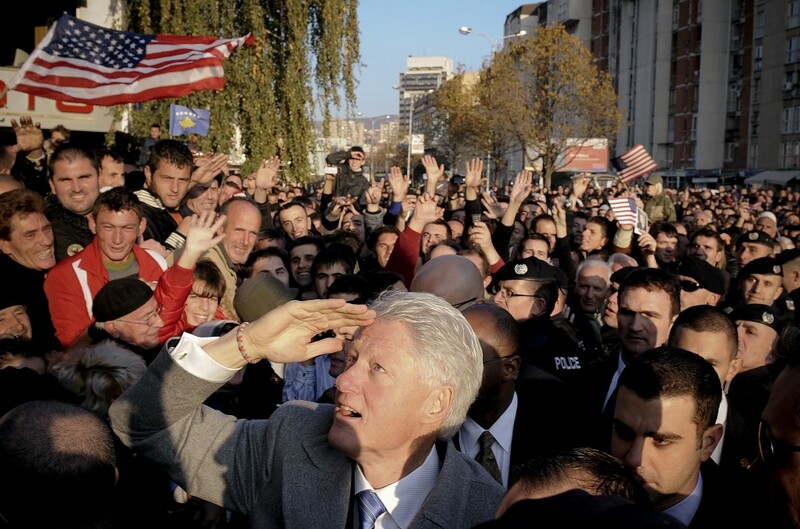 Abrahams pointed to Bill Clinton Boulevard in Prishtina, Kosovo, and the George W. Bush statue and the Hillary Clinton bust in Albania as signs of that long-standing support. Trump recently joined the ranks of American politicians symbolically honored in the region: Last year, Donald J. Trump Boulevard was was inaugurated by Mayor Xhelal Mziu of Kamëz, a suburban city adjacent to Tirana, the capital of Albania. The certificate naming President Donald Trump an honorary citizen of Kamëz. Mziu, a center-right politician, isn’t hiding his enthusiasm for the president of the United States. Not only was he the driving force behind naming one of Kamëz’s main streets after Trump, he also named the sitting president an honorary citizen of the city. “The president supports conservative values, especially in the fields of economy, foreign policy, and religious harmony. On the same time Trump is a great example of how to boost the economy, as the stock market went through the roof and has unemployment dropped to some of the lowest levels in history,” Mziu said in an interview at his office, which is not far from Donald J. Trump boulevard. Teenagers ride a horse-drawn cart in the Albanian part of Mitrovica after the Trump administration reaffirmed its support for a stable Kosovo, on February 20, 2017. With rampant unemployment and a large desire to leave the country, the American dream looms over the Albanian psyche. (The unemployment rate in Albania is almost four times higher than in the United States; in Kosovo, it is 7 ½ times higher.) Many Albanians have chosen to leave in recent years to countries in the European Union, and people from both Albania and Kosovo also regularly apply for visas to the United States. In 2015 for example, about 200,000 people in Albania — almost 7 percent of the population — and nearly 19,000 people in Kosovo applied for America’s Diversity Visa program. This program gives people from countries with historically low levels of immigration to the U.S. a shot at moving to America, and eventually becoming citizens. Trump has dubbed this program, also known as the green card lottery, as “terrible” and has said he wants to abolish it. Though the approval rate for U.S. leadership in Albania is higher than in any other place in the world, the country isn’t betting on one horse anymore. In recent years, Albania has been shifting closer toward Turkey, which the Albanian government identifies as one of its main strategic partners. Turkish companies have a large presence in Albania, and Turkey is helping the Albanian government with its underdeveloped tourism sector. Parallel to that, the Albanian government, with the help of Turkish Airlines, setting up a national Albanian airline carrier. Relations extend to even the personal level, as Prime Minister Edi Rama of Albania was a special guest at the wedding ceremony of President Recep Tayyip Erdogan’s daughter in 2016. Rakipi, the talk show host, meanwhile sees the unrequited affection for the United States as more pitiful than heartwarming. “Albanians often think their country is the centre of the world. That’s not fair to think. It’s pathetic to think that the world discusses and cares about us. If you would ask President Trump where Albania is situated, he probably wouldn’t even know,” he said. Top photo: A taxi driver holds a flare as he celebrates the victory of Republican candidate Donald Trump in the U.S. presidential elections, in Tirana, Albania, on November 9, 2016.